The Australian pair of Daniel Gaunt and Terry Pilkadaris had cause to celebrate after securing their best-ever European Tour finish in sharing second place in the Made in Denmark tournament. Their effort comes a week after Jason Day captured the PGA Championship while it is some 18 years after Gaunt and Pilkadaris shared leading medallist honours at the 1997 Australian Amateur. England’s David Horsey was never headed in leading from start to finish to capture a fourth Tour title by two shots. Gaunt signed for a final round 66 while Pilkadaris sadly struggled in recording the highest round among the leading 30 players, signing for a 74 for the duo sharing second with Sweden’s Kriss Broberg, who shot a new course record 62, while overwhelming hometown hero Soren Kjeldsen signed off for a 68. For the 36-year old Victorian-born Gaunt it was his best finish in 103 European Tour events and comes on the back of his prior best, and his only other top-10 result, in sharing ninth place in May’s BMW International Open in Munich after heading to the final day tied for the lead. A common thread in Gaunt’s emergence has been a decision to employ famed England-born caddy John ‘Ronnie’ Roberts on the bag. Gaunt and the Perth-born Pilkadaris collected a prize cheque each for €99,790. The effort took Gaunt’s Race to Dubai season earnings to €178,415 and that is just some €64,000 less than his entire European Tour career earnings of €242, 424. “I got off to a flying start today to be three under par after four holes and I then birdied eight,” said Gaunt. While Pilkadaris found it hard to hide his disappointment after a closing 74 at the Made in Denmark he proudly vowed to keep working towards a first European Tour win. 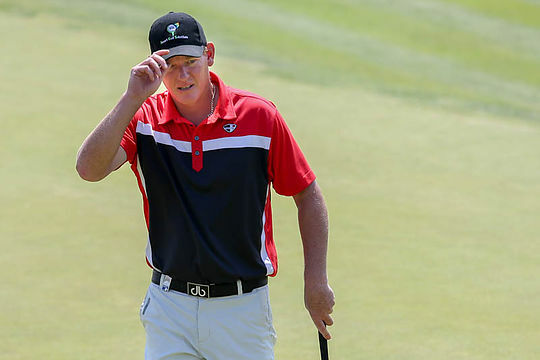 The Australian was playing just his eighth European Tour event of the year with his best result coming on the secondary Challenge Tour, a fourth placed finish at the Najeti Open in June. The West Australian had never enjoyed a top-three finish on the main European Tour with his best prior effort being eighth in the 2009 KLM Open and a similar result in the 2007 Singapore Masters. However Pilkadaris has won three times on the Asian Tour but with his last victory eight long years ago in beating fellow Australian Jarrod Lyle for the 2005 Brunei Open. Pilkadaris went to Denmark ranked 412th in the world and left with Tour career earnings of €209,288 after having earned just €109,498 in his prior 120 Race to Dubai tournaments. Rounds of 66-68-65 saw him head to the last day a shot behind Horsey and he even held the lead on the eighth tee after Horsey dropped a shot on the seventh. But back-to-back bogeys on the eighth and ninth saw the gritty Aussie drop out of the lead and a double bogey after having to take a drop on the 15th ended the 41 year old’s chances of becoming the oldest first time winner since James Kingston was victorious at the 2008 South African Airways Open. “The wind was really up today. From the seventh onwards it was a two to three club breeze. I paid the penalty on eight, and again on 15 when I had a flier out of the rough. Richard Green was the next best of the Aussies this week in Denmark finishing in equal 6th place with Western Australia’s Jason Scrivener another three shots back at 7-under and equal 14th.